When Professor Jane Buckingham declared that I should write a blog on the De Jong Collection in the University of Canterbury Library as part of a History Honours course on the Social and Cultural History of India, I knew enough about her mindscape and the tracks of my own, to realise that I would find plenty to interest me while meeting her demanding scholarly standards. This is the third course of hers that I have taken and have recognised that the university has a treasure in this charming Indophile. Experience had shown me that her directions would be pointers to an intellectual pathway of adventure and surprise. My first step was to understand who Jan Willem de Jong was, and how his personal book collection became an asset in the university’s Special Collections. Speculating when, where and why he bought certain books occupied my mind as I walked home through the chilly university grounds, clutching a dozen books he had touched and loved. Professor de Jong (1921-2000) was a noted scholar and the founding professor of South Asian and Buddhist studies at ANU, living retired in Canberra until his death. As a linguist and philologist, his broad interests spanned the Asian continent. He specialised in Japanese Buddhism and was much acclaimed in that country. A frank obituary shows him to have been a reclusive academic, not an outstanding lecturer but a generous colleague, although an acerbic critic of inferior work. As bibliophiles, the de Jong home was filled to overflowing with books. Damian Cairns the MacMillan Brown Special Collections librarian, described their house as a ‘library with bedrooms’. Although deeply attached to his home and family, de Jong’s mindtravelled through many places, cultures and timeframes, all linked to traditions first established in early Indian cultures. It is ironic that his personal book collection travelled across the Tasman Sea to reside permanently in Christchurch that most English of New Zealand cities, after posthumous purchase by the university. How many of our vibrant multicultural student body realise that a large portion of their literary history (12,000 volumes of it), waits to be discovered in the stacks of the campus libraries? Selecting from such a large collection is easy in a digital age with the judicious use of search terms. ‘India’ and ‘travel’ linked to ‘de Jong’ quickly produces a manageable list. Four books illustrate the several mindscapes that I travelled, from ancient to modern by both male and female authors, many intrepid travellers themselves. As a genre travel tales are a perpetual favourite. Historians are intrigued by the journeys of others, the more extreme the better to contrast with our own modern concerns. For armchair travellers those visions of distant and exotic landscapes lift us out of the ordinary and connect us into worlds of mystery and otherness. I concluded that Professor De Jong, and probably his wife Gisèle bought books on travel for personal pleasure. Figure 1. 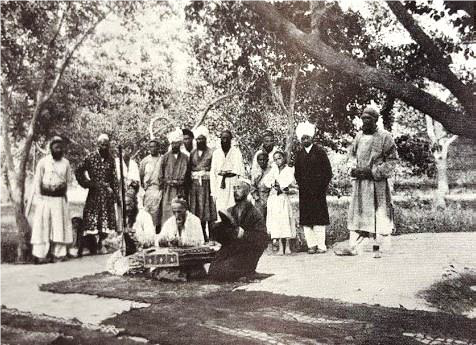 Sart musicians in Mr Macartney’s garden in Kashgar. Sarts and Indian servants in the background (Photograph: Mannerheim). The most scholarly and challenging book I attempted was a battered copy of ‘Yuan Chwang’s Travels in India (AD 629-645)’.1 De Jong would have regarded this as the bread and butter of his world as this is one of the earliest accounts of Indian Buddhism. Translated from the Chinese it recounts an arduous journey by a monk (now Xuanzhang) seeking the origins of his religion. This was an epic quest taking sixteen years along the northern and southern routes of the Silk Road. Having survived many dangerous encounters in the harsh terrain of Central Asia, he arrived back home to become a national hero, whose name is still honoured today. 1 Thomas Watters, On Yuan Chwang’s Travels in India, AD 629-645 (London: Royal Asiatic Society, 1961). Described as a seminal book in the collection, I was entranced the work of another national hero, this time a Finn. ‘Across Asia from West to East in 1906-1908’ by the explorer and soldier, Carl Gustaf Mannerheim is a first edition copy.2 Mannerheim is regarded as Finland’s greatest statesman. Volume One contains his daily journal from a trip across Asia to China, disguised as an ethnographic and archaeological expedition but was a secret intelligence gathering exercise for the Russian army. The second volume is a compilation of the scientific research he undertook by a team of eminent academics. Mannerheim was a prolific scribe who recorded in detail all he saw. His journal is very readable with almost every page illustrated with beautiful black and white photographs. For example, he describes fondly a month in Kashgar where he enjoyed the hospitality of the Anglo-Indian British agent, Mr Macartney. This included music in the garden provided by Sart (Uyghar) musicians attended by Indian servants, an event Mannerheim captured in an exotic photograph that depicts the pleasures of this remote post (Figure 1). 2 Carl Gustaf Mannerheim, Across Asia from West to East in 1906-08, Vol. I. Records of the Journey (Helsinki: Suomalais-Ugrilainen Seura, 1940). 3 Joe Randolph Ackerley, Hindoo Holiday (London: Chatto & Windus, 1932). 4 Dervla Murphy, Where the Indus is Young: A Winter in Baltistan (Newton Abbot: Readers Union, 1978). Edward Conze (1904-1979) was unquestionably a major figure in the development of Buddhist studies during the twentieth-century (especially his work on studying and translating the Sanskrit Prajñāpāramitā texts). 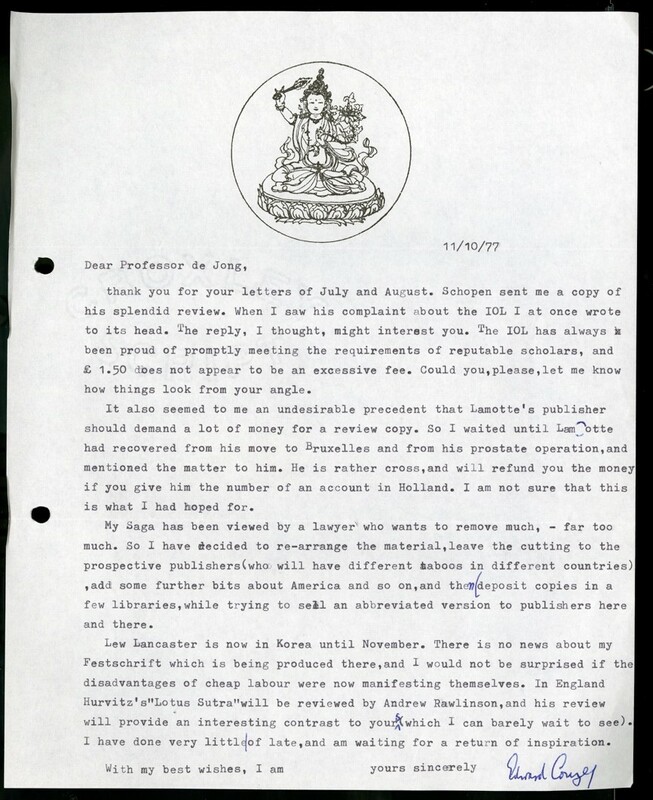 Conze’s correspondence with JW de Jong (1921-2000)—another major academic figure in Buddhist studies—d is preserved in the De Jong collection of the University of Canterbury. From the mid-1950s until 1979 there are around 120-150 items preserved in chronological sequence. The letters deal almost entirely with matters of translation, publication exchanges, academic vacancies, new appointments, book reviews etc. and contain very little discussion of academic issues (a sample showing Conze’s distinctive letter head is shown in Figure 1). Conze’s academic papers are housed in the University of Bristol library. At de Jong’s request Conze wrote about his life in The Memoirs of a Modern Gnostic (Sherborne: The Samizdat Publishing Company) (see Figure 2); only volumes 1 and 2 have ever been released. The third volume was apparently too problematic and a potential source of legal action. On the occasion of the workshop on the de Jong collection in Christchurch (late-2016) I thought to try to locate any information in the preserved letters about the third volume. The extracts below outline the progress in the preparation and eventual publication of Conze’s memoir and provide information on how he worked on it, the number of copies, etc. No copy of the elusive third volume has turned up in the de Jong collection however.